From Left: Youman Jacob, Coochie Martin, Unidentified, Wendell McNeil. Photo courtesy of Samuel and Ann Charters Archives, University of Connecticut. 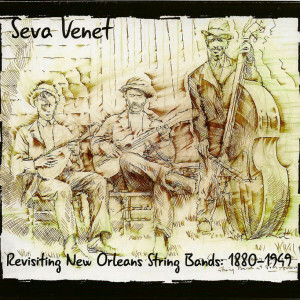 During the last two decades of the 19th Century, string bands with skilled Creole musicians were in high demand all around New Orleans. 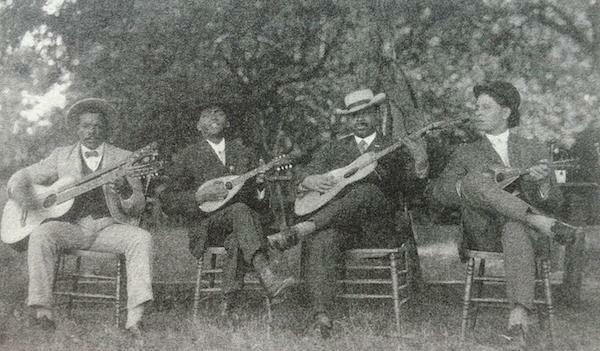 They performed at various functions, including picnics, parlor room parties and balls. Between 1884 and 1917 there were major changes in how the music was played, brought on by the changing demands of dancers and the changing attitudes in response to the implementation of the Black Codes (U.S. laws limiting civil liberties of blacks) in the late 1800s. There were three main types of ensemble performing around New Orleans from the 1880s to 1917: brass bands (for funerals), society orchestras and string bands. Being smaller and in demand in more diverse settings, the string ensembles had more flexibility and were expected to entertain with up-to-date songs and dancing music. In 1897, the Storyville District opened, and at Tom Anderson’s Annex on the corner of Basin Street and Canal there was a string band that played every night that, over the decades, featured musicians such as Wendell McNeil (pictured above), Bill Johnson and, probably, Lorenzo Tio, Jr. The location of this venue, at the border of the uptown and downtown areas, is highly symbolic, as pioneers of the new musical concepts arose from the cultural interaction between uptown and downtown groups. The concept of a swinging ensemble dominated by a rhythm section of strings was picked up in the 1920s by the Belgian gypsy guitarist Django Reinhardt and his peers. 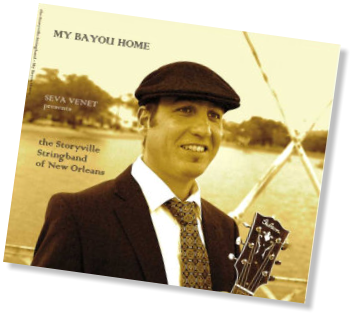 In the 1930s and ‘40s, Western Swing bands and Bill Monroe’s bluegrass groups followed suit in string bands tinged with New Orleans jazz. It isn’t until the late 1940s that we have recordings of a New Orleans string band, a quartet formed around 1910 and modeled after the bands the players had heard in Anderson’s Annex. This band, Edmond “Doc” Souchon’s 6 7/8 String Band, with rhythm guitar, mandolin, “Hawaiian” slide guitar and bass, may be the best surviving evidence of a string band in the style of collective improvisation on early ragtime, society, pop and novelty tunes played around the turn of the century.